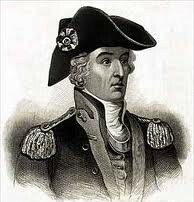 Francis Marion (1732-1795) was a South Carolinian militia commander during the Revolutionary War. Marion’s family were French Protestants who settled in South Carolina in the early 18th century. As a young man, Marion had a short but unsuccessful career as a sailor, before becoming a planter and serving in the colonial militia during the French and Indian War. Marion became successful enough to earn a seat in the South Carolina assembly. On the outbreak of the Revolutionary War, he volunteered for service and held two commissions, serving as a brigadier general with the South Carolina militia and as a colonel with the Continentals. For the first three years of the war, Marion’s contribution was confined to training troops and commanding garrisons. As the war moved into the southern colonies (1779-80) Marion became a prominent leader of small militia brigades. Under Marion’s command, they carried out raids and ambushes, targeting British positions, supply lines, convoys and well-known Loyalists. Marion’s tactical skill, his thorough understanding of local terrain and his use of wetlands to elude trackers earned him the nickname ‘Swamp Fox’. The character of Benjamin Martin (Mel Gibson) in the 2000 motion picture The Patriot was modelled on Marion’s military exploits. Unlike Martin, however, Marion was notorious for his brutality, the worst of which he visited on African-Americans and Native Americans who sided with the British. Marion was a slave owner himself and historians have unearthed evidence of his brutality and sexual assault against his slaves.